Each of these items is associated with the celebration of a holiday. Bells, fermentation for the making of alcohol, gunpowder, and the curing of meats were developed thousands of years ago . . . and all of these began in China. One of the most important advancements in civilization was the storage and preservation of food. Being able to take advantage of times of plenty and saving for times of famine enabled man to survive and to be more mobile. Many give credit to the Chinese for developing the technique of curing pork as early as 4,900 B.C. The city of Jinhua, China has been curing hams for more than 1,000 years. In fact, it is rumored that Marco Polo took their ham-producing techniques to Europe. And then, in the 16th century, the explorer de Soto brought swine with him on his voyage to the New World (imagine for a moment how pleasant that journey was). So pigs and pig-processing circled the globe. There's more to the story, but at this point, I must be perfectly honest with you—researching the history of ham is not an easy task. I used that specific phrase when I began writing this article and received over 86 million results on Google. However, countless of those are a reference to amateur radio, a parish in Surrey on the Thames, the first chimpanzee in space, the youngest son of Noah, and bad acting (not necessarily in that order). I'm sure all (most) of you know that ham is a pork product, but exactly what part of the pig is involved? Yes, it's the leg, but specifically the hind leg. Most mature pigs weigh in at about 200 pounds, and the "hams" are about 30 pounds each, or almost 1/3 of the total weight of the beast. All About Curing. Dry, Wet, and What's the Difference? At the factory, a pig's thigh is marinated in salt for up to two months. The salt is eventually washed off and then the leg is hung up to dry for four to five days. 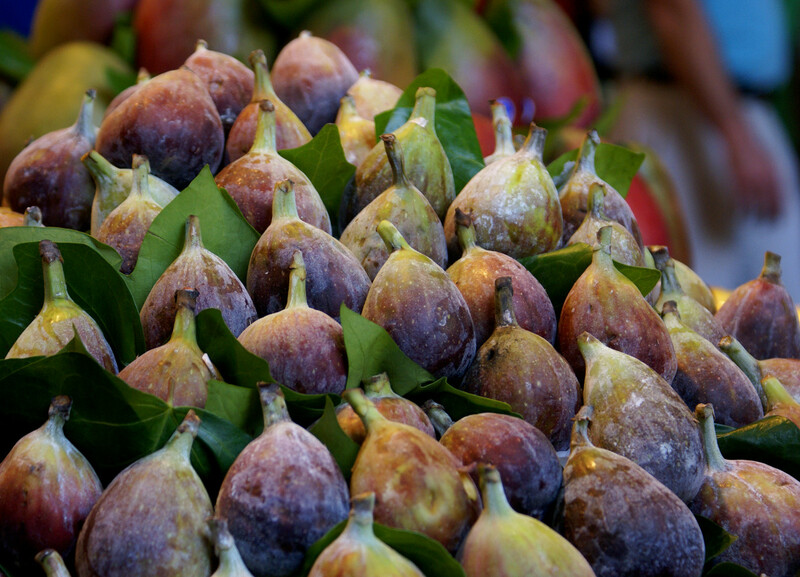 After that, it is left in a low-temperature room to naturally ferment for around five to eight months. The popularity of ham can also be traced to the producers’ geographic location. The conditions required for curing meat need to be such that it is not so cold that the ham freezes, unable to cure, or too warm causing the ham to spoil. The result is distinct areas around the world renowned for their particular hams. Italian prosciutto and Spanish Serrano, as well as American country ham from Kentucky and Virginia are all located on what can be described as the worlds Ham Belt— a geographic area bound by latitude and historically producing the world’s most revered hams. Dry-curing results in a product that is hard and dry but can be stored at cool room temperature. It needs to be soaked for a day (or two) before cooking. The production of a wet-cure ham is much less expensive because it takes much less time, but it results in a product that must be kept under refrigeration. A curing solution of saline and sodium nitrate is injected into the meat (or massaged in by tumbling the hams in a vat of brine). Smoke flavoring might be added to the curing/brining solution or the hams could be smoked after curing. Partially cooked - Labeled as "cook before eating". Must be brought up to an internal temperature of 160 degrees F.
Bacon, speck, pancetta, prosciutto. Country, city, and Parma hams. What's the difference? They are all "ham-ish" products, and some of them even look alike, but they're not the same. It all depends on how they are seasoned, cured, and smoked. Let's explore the possibilities. Bacon and pancetta have the most in common. They are both cured and are made from the pork belly (not the rear leg). Both are also considered "raw" and need to be cooked before eating. However, pancetta is typically sold either diced or in paper-thin slices. Bacon is cured, but it's also smoked. Prosciutto is from the rear leg of the pig; it's a cured ham. The meat is salted and then air-dried anywhere from a few months to several years. The longer the meat is aged, the drier, darker, and more concentrated in flavor it gets. A 24-month prosciutto will have more funk and complexity than a 12-month. 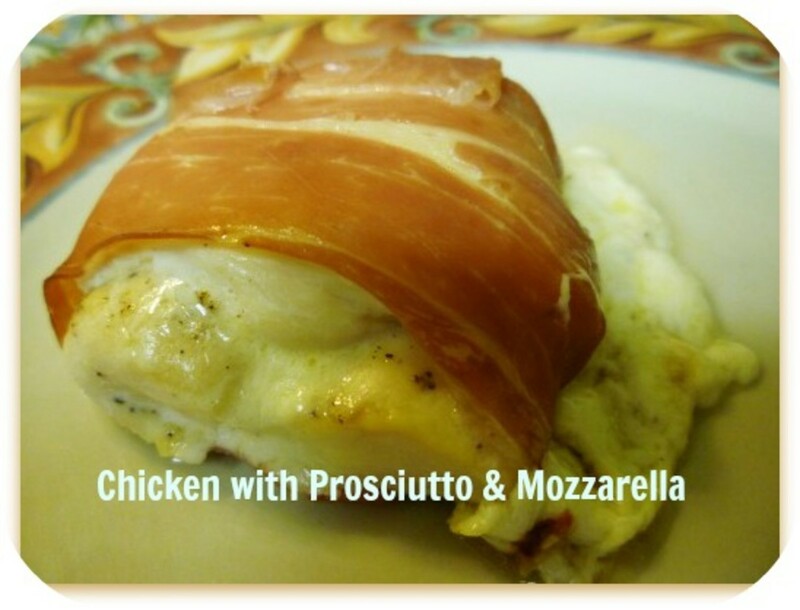 Prosciutto, like pancetta, is sliced paper thin but it is not cooked other than perhaps a quick tumble with hot pasta. Speck is a close cousin to prosciutto. What makes it different is that it is boned before being seasoned and dried. And, it is seasoned with juniper berries and bay leaves. This is the South's answer to prosciutto. It's salty, a dark mahogany color, and dry aged in what for most of us would be a brutal climate. Seasonings and spice rubs vary from town to town, and even from family to family (and are closely guarded secrets). 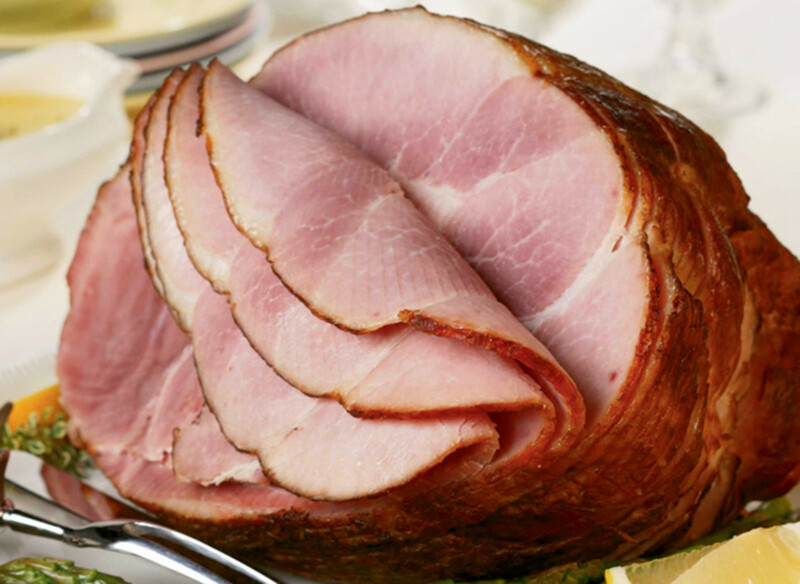 A 15-month ham is considered a true treasure. 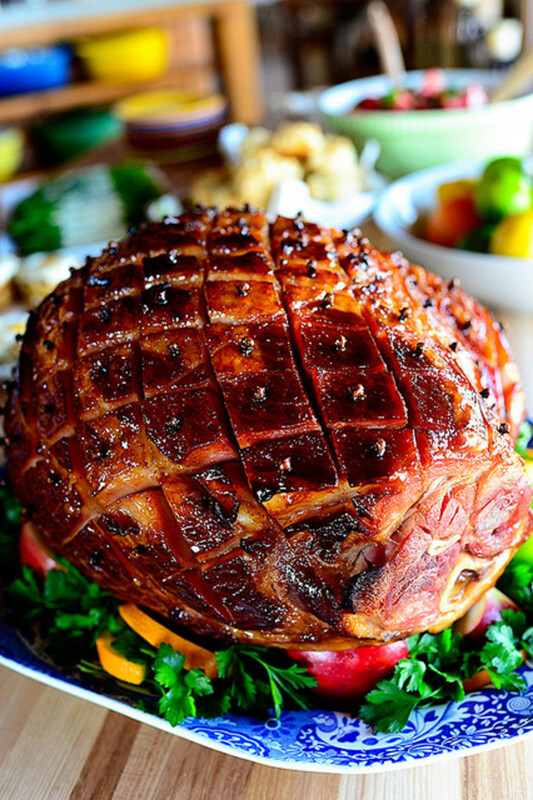 City Ham is the standard for the Easter dinner, often spiral-sliced, glazed with honey or brown sugar, and (in a Norman Rockwell world) studded with whole cloves. These are brined instead of being dry-cured. They are often sold fully cooked. Pigs are not native to America. Christopher Columbus carried eight pigs on board with him when he left Spain for the New World, but explorer Hernando de Soto's 13 pigs became the breeding stock for America's pork industry when he landed on the coast of Florida in 1539. Within just a few years, his passel of hogs grew to 700. By the 17th century, most colonial farmers raised pigs. 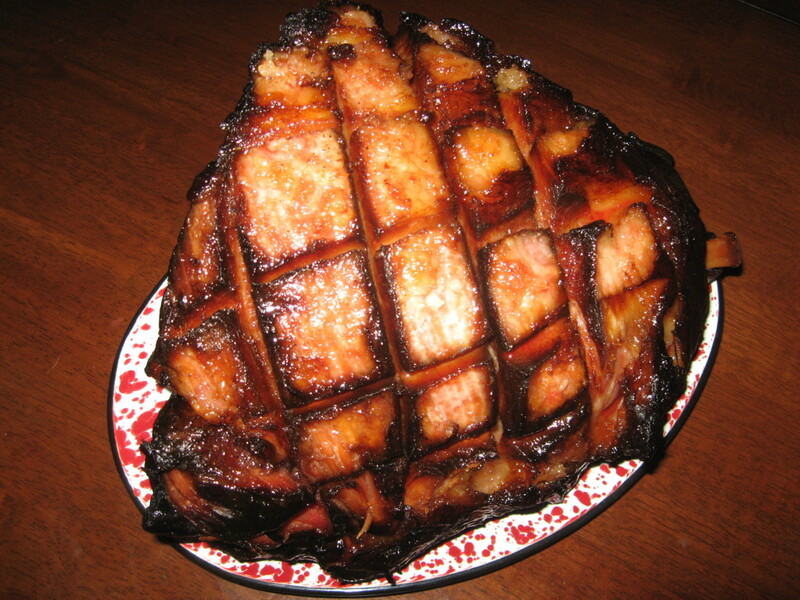 Due to a Civil War surrender agreement, Virginia Baked Ham was given that name to insult the residents of Virginia. In 1941, a tentative peace agreement was struck between France and Nazi Germany. France agreed to supply the Germans with 7 tons of ham a week, but the German army quickly discovered the ham to really be corned beef—the war then resumed. FEMA keeps a reserve of 3.6 lbs of canned ham for every American. 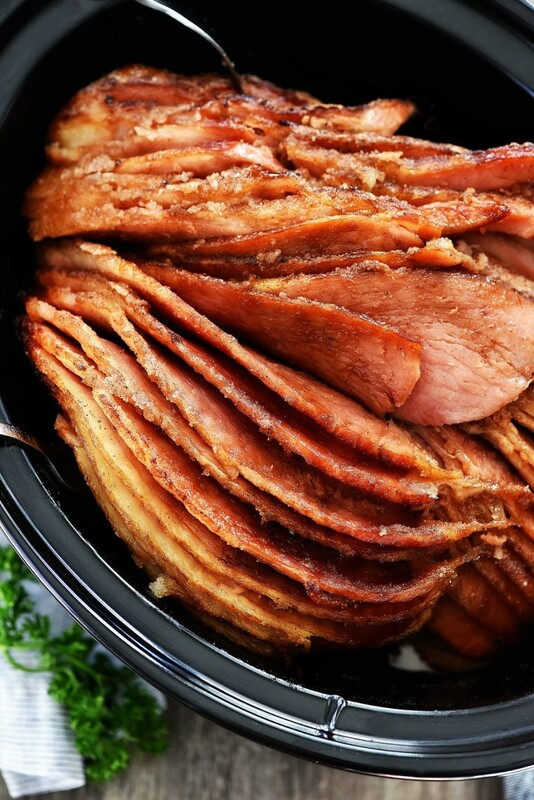 Ree Drummond (aka The Pioneer Woman) provides step-by-step photos and instructions for making that "famous" Easter ham, the one with the sugary glaze and clove-studded diamond pattern on top. Even if you've never cooked a thing in your life, I know you can do this. It's that easy! Slicing a bone-in ham has always been a challenge. But 66 years ago that all changed when Harry J. Hoenselaar invented the spiral-slicing machine. It works by skewering a ham (or any other meat) vertically on spikes at top and bottom. A spring-loaded slicing blade cuts through the meat, stopping when it meets resistance from the bone. As the ham rotates, it gradually lowers on the spikes, creating the spiral. The patent on Hoenselaar's machine has expired and so now the doors are open for any and all to use the spiral-slicing technique which eliminates the hassle of carving. This recipe for slow-cooker baked ham coaxes those slices into tender, melt-in-the-mouth submission. And it's fix and forget. Who doesn't love that? 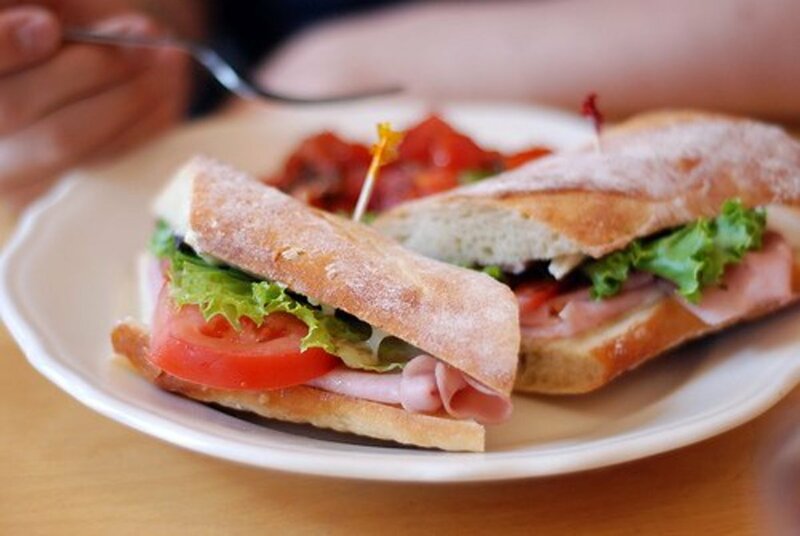 Ham sandwiches are an obvious use of sliced ham. But you can eat only so many of those. C. S. Lewis waxed eloquent of ham and eggs—a guilty pleasure that few of us can afford to impose on a daily basis on our hearts or waistlines. Here are some solutions. Ham and a comforting bowl of soup--they're simply made for each other. Here are two different soup ideas; one is a creamy cheesy chowder and the other is full of veggies and beans. This is a dump it and leave it dish. Cover and cook on low for 8-10 hours. 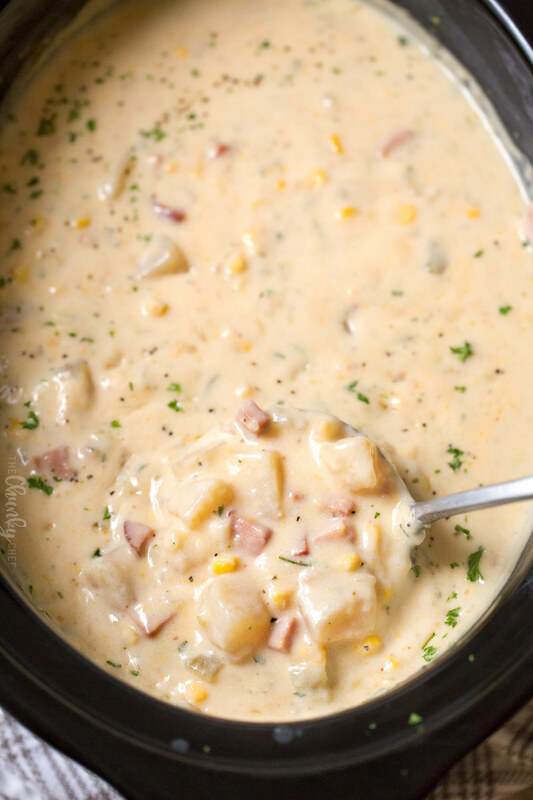 When you get home you will be greeted by this rich, thick, comforting chowder. 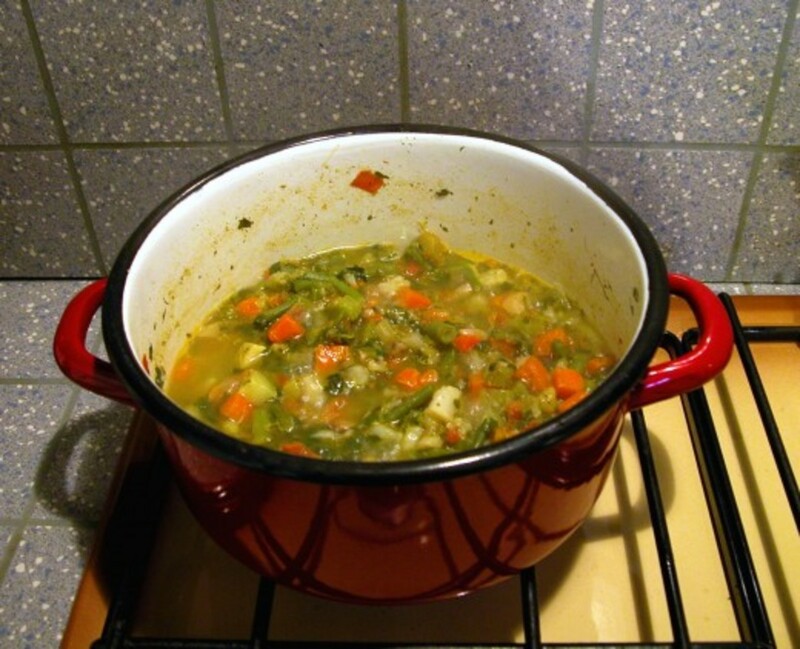 This is my "almost world famous" recipe for homemade split pea soup. Yes, it takes a few hours to make, yes as presented it is vegetarian, but you can certainly add a cup (or more, if being decadent) of finely-diced cooked ham. First, wash and sort* your white beans. Next, place your washed beans in an 8-quart stockpot. Add enough water to have about 2 inches of water above the beans (about 6 cups of water). Bring to a boil over medium-high heat. Boil 2 minutes and then remove from the heat. Cover and let stand for 1 hour. This soaking time will reduce the actual time the beans need to simmer and will help retain nutrients. Drain the beans after soaking and cover with 5 cups of fresh water. Return the stockpot to your stovetop; bring the beans to a simmer over low heat and cook for 90 minutes or until the beans are tender but still hold their shape. Now it's time to add the star of the show, the split peas, along with the next 5 ingredients. Stir gently, and allow to simmer for one hour. Stir in diced potato, tomatoes, and sage; cover and simmer 10 minutes more. Add salt and pepper to taste. These two salads are substantial enough to make a meal. Perfect for a picnic, potluck, or dinner on the patio. This recipe from the Food Network is full of bright fresh flavors. Fresh or frozen baby peas add color and sweetness. Celery provides great crunch and texture, and the dill is bright and herby. 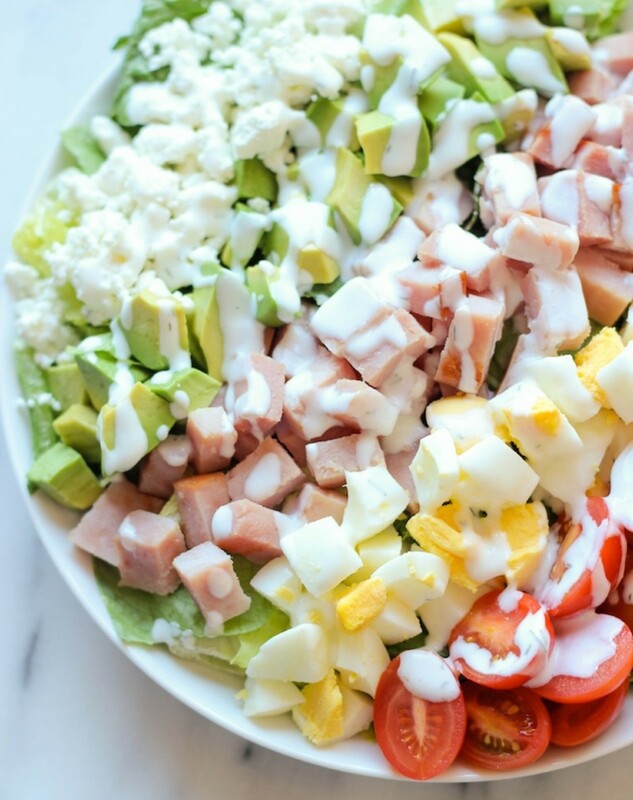 The traditional cobb salad features crisp cooked bacon as the smokey contrast to eggs, cheese, and crunchy veggies. Chungah (Damn Delicious) creates a beautiful salad with a creamy almost guilt-free Greek yogurt dressing. These sandwiches go beyond the simple ham and cheese between two slices of white bread. 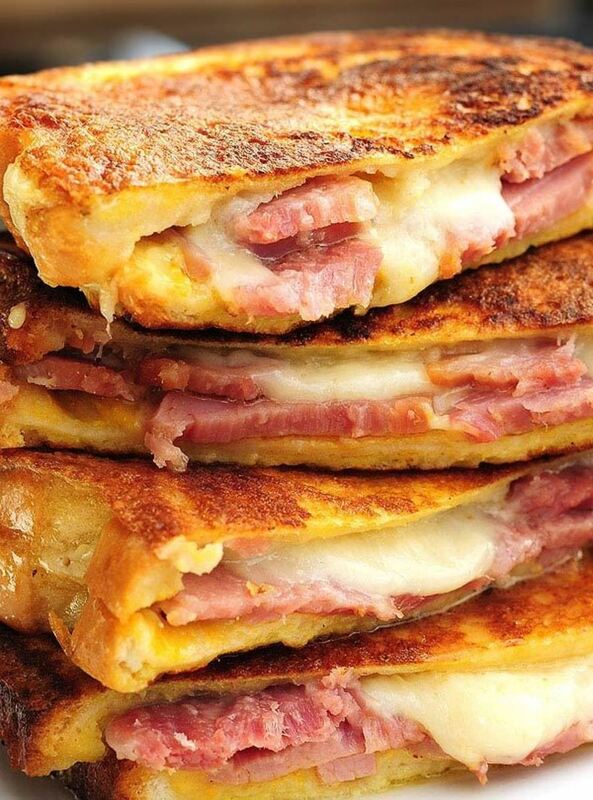 What is a Monte Cristo? Imagine the absolute best ham and cheese sandwich. And then, imagine that amazing sandwich falling in love with French toast. They marry and have a baby, and the Monto Cristo is born. 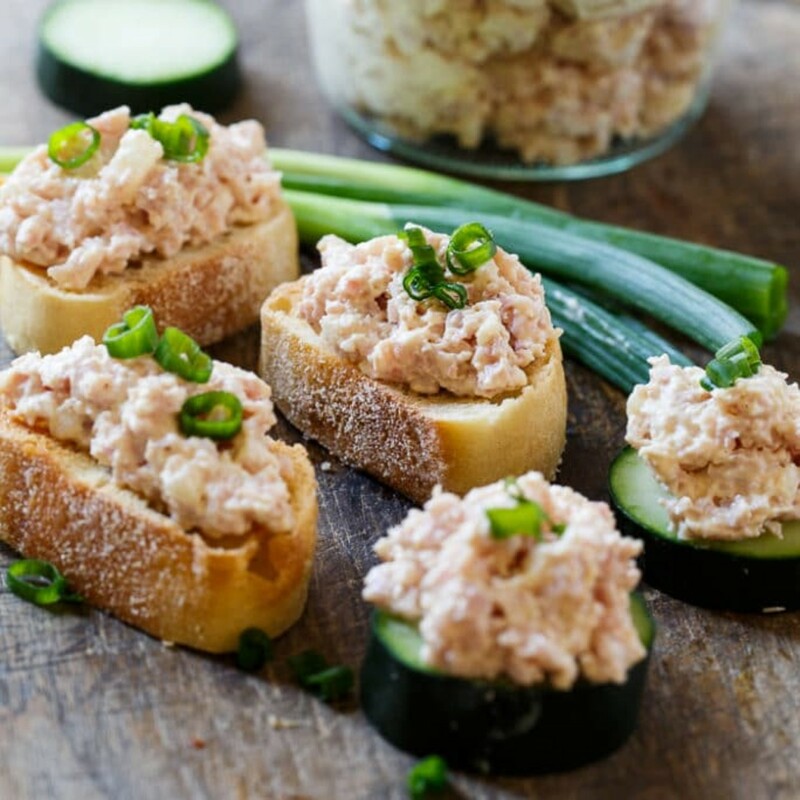 Do you remember the deviled ham spread sold by the Underwood Co.? It's convenient, tasty (I probably lived off of it for a time during college), but so salty. You can make your own in just moments. 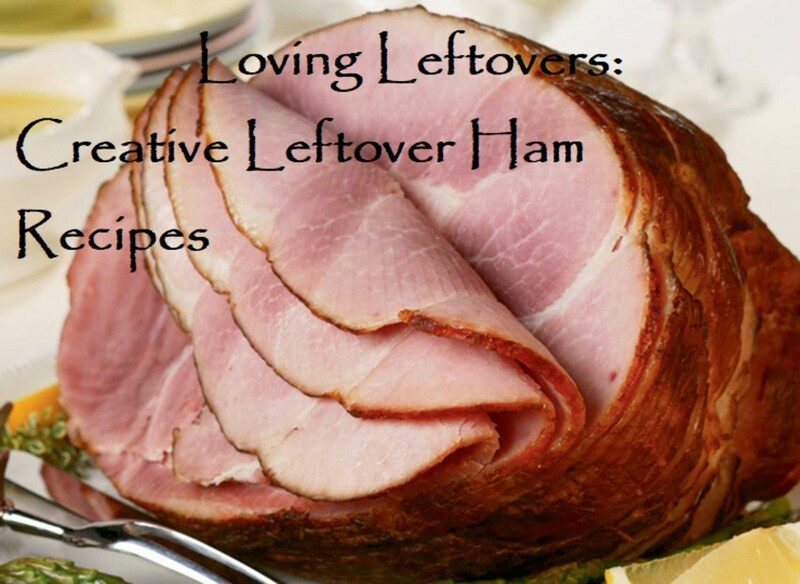 Homemade deviled ham has fresh ingredients and you can control the amount of sodium. By the way, I add finely diced celery to mine for a little more crunch. These two dishes could be served any time of day. They take only minutes to assemble and use fresh ingredients. Oh Lord, have mercy! Is this breakfast, brunch, lunch, or dinner? Is it a sandwich or a snack? I don't care. 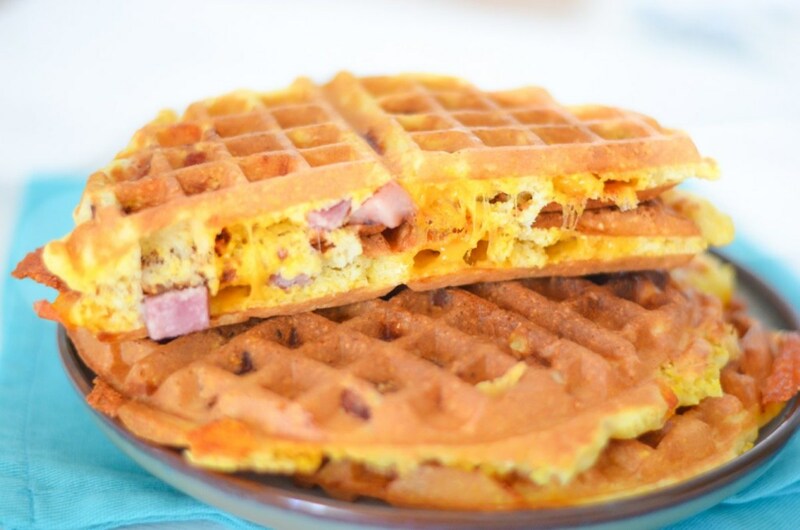 I just know that I want one of these ham-cheese waffles right now . . . but first I need to bake a ham. These ham patties made with finely diced ham and potatoes could be part of a lazy brunch, a mid-day meal, or a light dinner with a salad or fresh veggies. How to Wet Cure (Brine) Ham at Home: It's Easier Than You Think! Lawrence, that is an interesting fact that I did not know. Thank you for adding to my article. Great recipes here, and a little-known fact. Before Humans arrived in NZ the place only had Birds and insects. The first Maori arrived around 1,300 AD and they brought two animals with them, the Chicken and the Pig. They've been part of the staple diet ever since. We're talking 60 years ago, so it will have to be more instinct than memory. 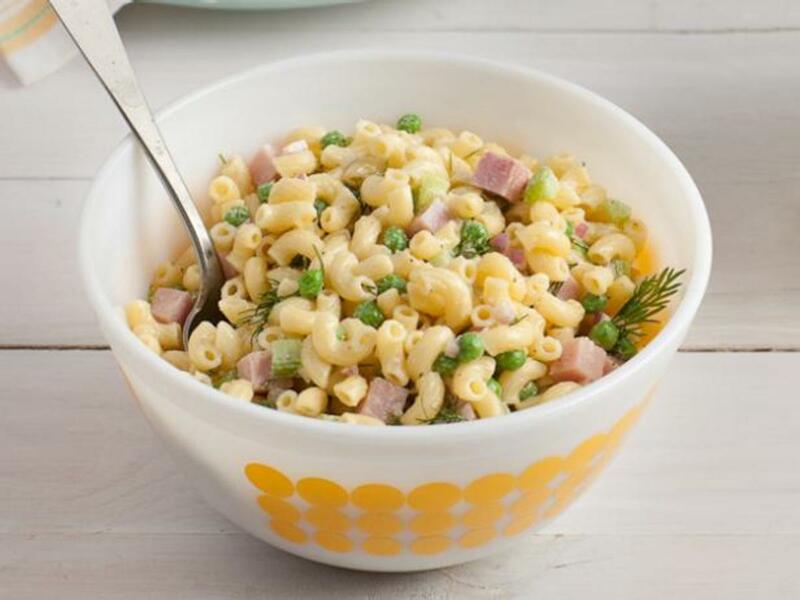 Kari, ham in chowder or split pea or bean soup is such a wonderful bowl of comfort. You are the 2nd person to comment on the ham cakes. Long before I could read or write, I was always in the kitchen. Nosy little me, probably driving mom or sis crazy with the constant barrage of "why, why, why?" 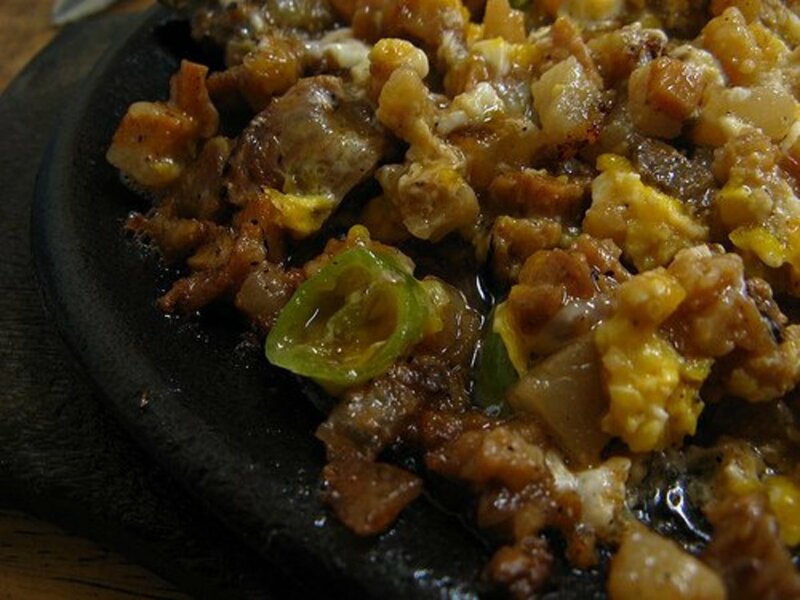 I am recalling something that my sister would make which was a 50/50 blend of ground (fresh) pork and ground ham. 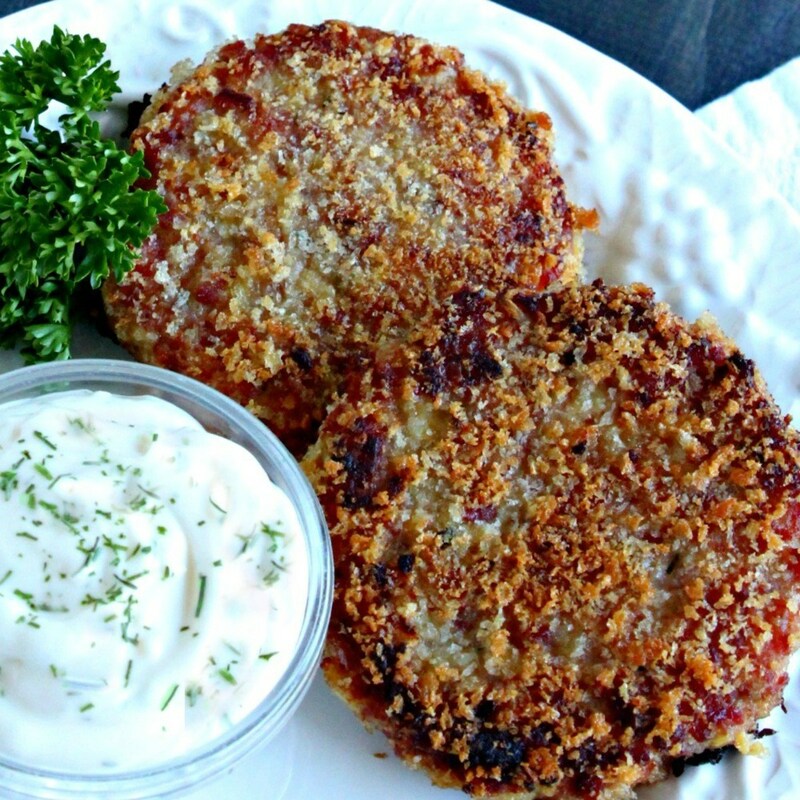 I think she added raw grated potato and onions and then formed it into patties to cook. There might have been an egg in there also to bind it all together. I'll experiment, and if I rediscover the "secret recipe" I'll add it to this article. Shauna, your mention of the dough crust is awakening a memory in my wee little brain. I believe that once in a while my mom would make wrap a beef roast with dough to lock in the moisture. I think it might work the same as a tagine. Ham and beans is a wonderful comfort food, and something I've missed for a long time. The ham patties ARE very good and yes, they are a bit like latkes. Thanks so much for your kind comments. I prefer salty ham to the sweet glazed variety. When I bake ham, I wrap it in pie crust and bake for a few hours. When done, take the crust off (I can never seem to not nibble on the ham-drenched crust as I'm peeling it off). You're left with a very moist, juicy ham. I learned that trick from my mom, who was born and raised in Missouri. Beans and ham is a favorite dish of mine to make with the bone and leftover ham. Of course, I always slice and freeze some of the larger portions to save for other ham-hankerings that may strike. The ham patties you feature here look interesting, Diva. I've never seen or eaten them. They look very much like a potato (pan)cake. Eric, there are SO many ways to use ham leftovers. I just barely scratched the surface. I hope you enjoy that Easter ham. I agree with you Bill, that's why I tried to find creative ways to use up those leftovers. 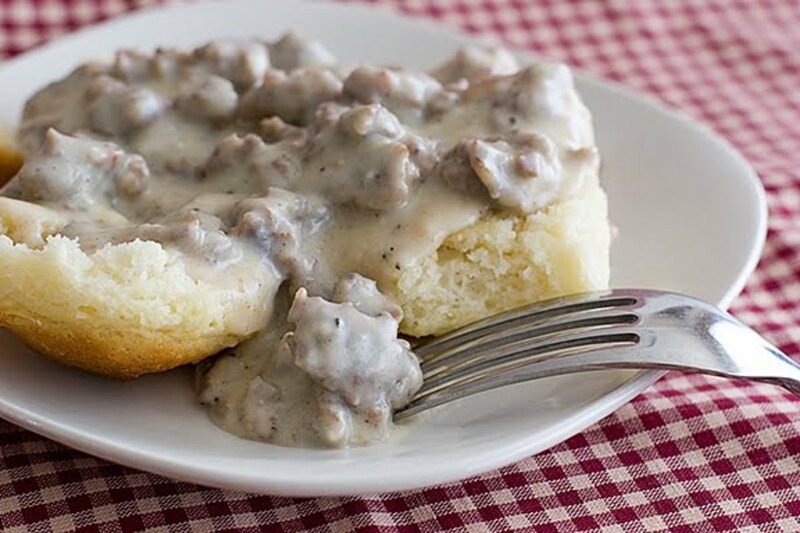 Give the ham cakes a try. Flourish, if only those relatives had read this article first. Oh dear! Perfect panini? That's a great idea. I'll add it to the list. Thanks. How cool is this!? I can hardly wait for Easter. I have always just bought it fully cooked. But not anymore. I definitely will be adding it to salads and pasta dishes. Thanks much. Ham is one of those foods that I absolutely love, but I can't eat too much of it. I wonder if it's because of the salt? I grow tired of it very quickly, but man alive, that first meal when it is warm out of the oven....pure heaven! In Virginia where I live, country ham is the thing, although I no longer eat it. A friend once sent some relatives up North a generous gift of a whole country ham. Because it didn’t look pretty on the outside, they thought it was rotten and growing mildew whereas it was simply dry cured! The relatives threw the thing away! Very expensive! Looking at that Monte Cristo sandwich makes me jealous. Perhaps you should think about an article about making the perfect panini.